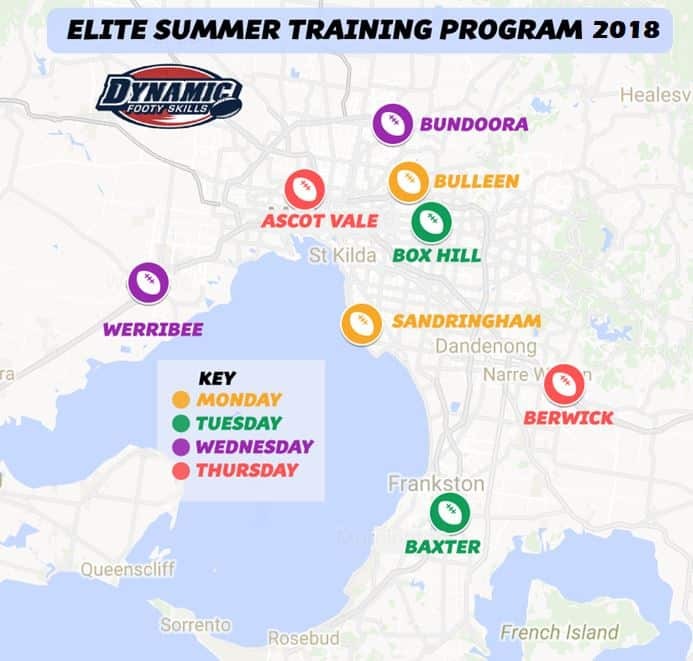 Registrations for the 2018 Elite Summer Training Program are NOW CLOSED! Do you possess the ability, attitude and ambition to be the best you can? Would you like to be mentored by elite coaches with TAC and Inter-League Rep experience? If you answered YES, then the Elite Summer Training Program is for you. Expression of Interest for the 2018 Elite STP will be open shortly. This years’ program will be the 15th Elite development program, of which over 2,500 talented players have completed. Including current AFL players Brayden Sier (Collingwood FC) and Nick Coffield (St Kilda FC). The STP is split into two age-specific development programs, with players training in their very own, age-specific squad. The STP also has a specific Girls Program (GP) which caters for all Youth and Junior Girls, subject to numbers per location. 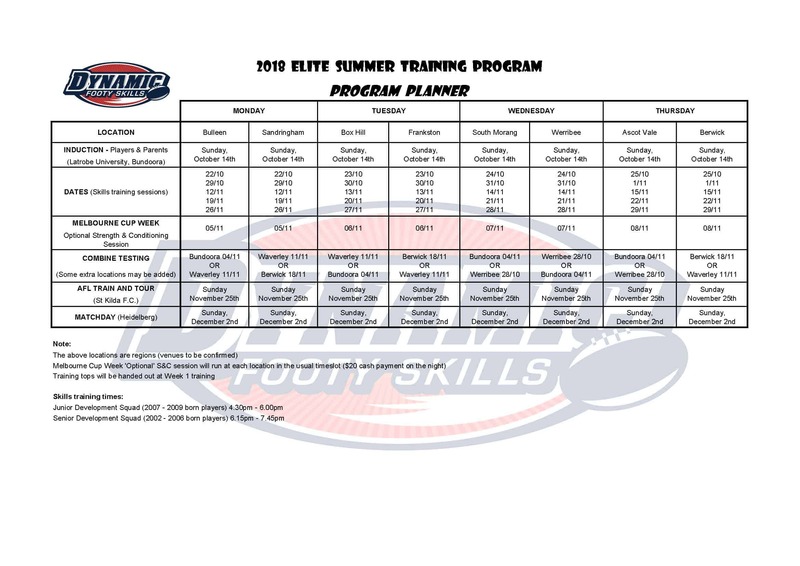 Utilising the most elite junior coaches with experience at inter-league, TAC, VFL, AFL and State representative football, the Elite STP is regarded as the peak development program within the industry. The 2018 Elite STP will be the 9th ‘off-season’ development program held by DFS. – Port Adelaide Premiership Coach, Mark “Chocco” Williams. Plan your holidays well in advance and avoid any clashes with your Elite STP training sessions. If you do miss a session, don’t stress… You can complete a ‘make-up’ session at any other venue. Training times. We anticipate that every venue will have the below training times. In the case of any variations, we will contact each venue participant to inform them. This is a dual angle video camera analysis of your kicking action, completed by the DFS Director of Coaching, Adrian ‘Tala’ Talarico. Tala has completed over 800 DFS kicking analysis videos! The video link will be emailed directly to you, allowing you to access it anytime. You will also receive exclusive access to the DFS AFL player ‘model kicks’, to help you understand the exact areas that Tala mentions during your kicking analysis. This is an individual program designed for you by our Strength & Conditioning ‘gurus’, based from the results you achieve during the AFL Draft Combine Testing. Our ‘gurus’ have written over 400 Xmas training programs, specifically for DFS players. The program will focus on specific areas you want to develop, improve or maintain. It includes a 6-week program, detailing week-to-week, day-to-day activities for you to perform during the Xmas break. During this year’s STP, players will have the opportunity to register for a range of optional Strength and Conditioning programs. This is a 90 minute Strength and Conditioning session, at each of the STP locations. Sessions will be held during Melbourne Cup week (Nov 3rd – 7th), as there is NO skills training during this week. Our S’n’C gurus have designed this program, which will focus on the physical attributes required to play at the elite level. During the 2013, ’14, ’15 , 16 & 17 programs, over 610 players completed this optional session. This session is only $20. Registrations open AFTER the commencement of the 2018 Elite STP. Each players is eligible for 1 testing session at a venue of their choice. There is no extra charge for this as this is inclusive in the Elite STP registration fee. This session gives players a chance to complete the same AFL Combine testing that are performed by AFL draft hopefuls at the National AFL draft combine. Results will also assist the DFS Strength and Conditioning coaches when completing each players Xmas training program. Xmas training programs are an optional extra for players. (Please click on the ‘Xmas Training Programs for full details). The Elite PTP is designed to have each player in peak condition before Round 1. The 2019 Elite PTP will be held between February and April. 4 x 2hr training sessions, incorporating Game Sense and body on body training, specific strength & conditioning and open skills training.